I discovered Vancouver’s Fluevog shoes just in the last year or so, and ever since I have been developing a collection of gorgeous shoes. Fluevogs are very well made, beautifully designed, unique and interesting shoes. I’m discovering that there is definitely a Fluevogian attitude that celebrates creativity. People who wear ‘Vogs are people I enjoy meeting. I have purchased all my ‘Vogs online, either through www.fluevog.com or eBay, but I dreamed of the day that I would be able to make a pilgrimage to the flagship, original store in Gastown. 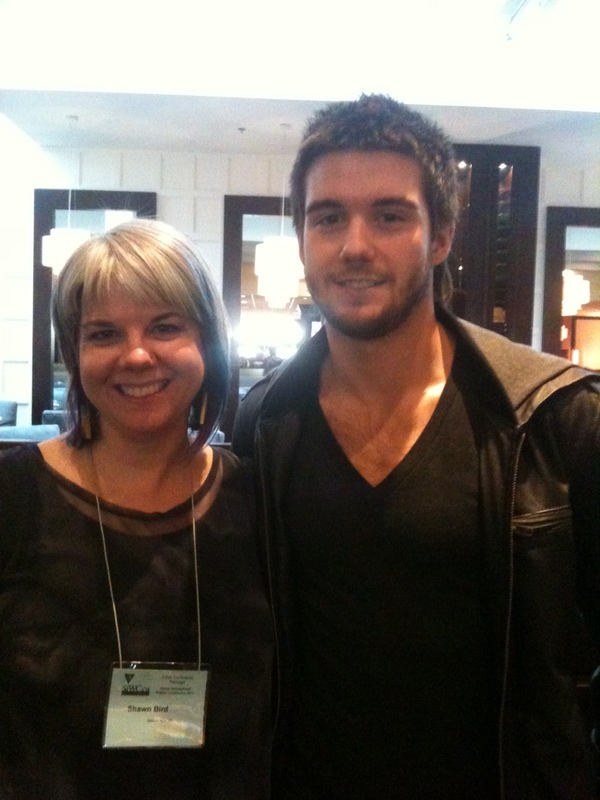 When I went to Surrey for SIWC2012, I took the opportunity. I parked Sheila the Bug at the hotel, and took the bus and Skytrain into Gastown. 55 minutes X 2 trips in order to spend a few minutes in a store that had originally been a car park. It’s all glass front and roof, and log slices artfully display the most brilliant shoes on the planet in the abundant natural light. I had two shoe styles that I wanted to try on. The first was the new Elizabeths with the ball and claw heel that mimics Chippendale style furniture. So cool! Unfortunately, the Elizabeths rubbed in a bad place, so I will have to wait for future shoes coming out with this amazing heel. The second shoes were the K2s. 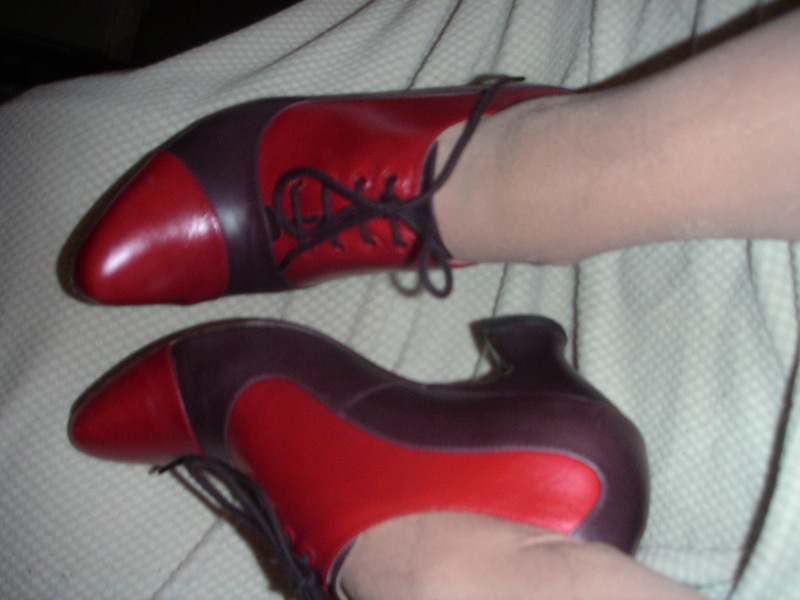 I have worn similar shoes (in boring black) and had them until they fell apart. I know Oxfords are a great, every day style shoe for me. The K2s were a perfect fit, soft leather, fun vibrant colour combination, great heel height, and eye-catching, as well. My kind of shoe! They were an easy, “Yes!” and into the lovely paper bag they went. After my shoe purchase, I headed across the road to The Coffee Bar to have dinner with Citieguy Paul Schellenberg who is a local impresario. Paul and I were Rotary Exchange students together years ago. He went to Belgium when I went to Finland. It’s been quite a few years, and it’s fun to see where we’ve taken the skills we developed as exchange students! It turns out that The Coffee Bar is a favourite haunt of my son, who works for 49th Parallel Roasteries, which supplies the coffee that is served there. The cashier raved about how wonderful my son is, and I told them to tell him that they’d met his mother. <g> Nothing like embarrassing your kid, right? The visit with Paul was all too short, because I had a big night ahead of me! The lovely Fluevog paper bag dissolved on the way back to the hotel, in the humidity of the miserable rain, but nothing could wash away my enthusiasm! I put my new shoes onto my feet and headed off to Chapters at Strawberry Hill to meet authors JJ Lee, Michael Slade, CC Humphreys, Mary Balogh, Jack Whyte, and Diana Gabaldon. Of course, besides helping to meet amazing new people, the best thing about having distinctive shoes, is that whenever I wear these awesome K2s, I will remember that I was wearing them when I met my favourite author, Diana Gabaldon! <g> It will remind me of her writing advice and generous spirit. Creative shoes. Creative people. Creative spirit. Creative life. There are 99 days before the Surrey International Writers’ Conference, and I’ve just remembered I have to prepare for my pitch. I’ve been so excited about my blue pencil appointment with Diana Gabaldon that I’ve completely neglected the fact that I have an agent to meet with. I anticipate having Grace Awakening Myth ready to pitch, or perhaps Number Eight, a high interest, low vocab novel I have had ‘just about finished’ for two years. (Seriously, it’s missing about 2000 words, but Grace was a bully and completely took over). The last time I pitched at a conference, I ended up with a contract for Grace Awakening with a small Vancouver publisher. This time I’m meeting with a big time New York agent, and I feel a little out of my depth! Writers’ Digest features a post this week on how to pitch to agents at conferences. I am eager for the tips, and perhaps you’ll be interested, too. See you in the appointment line!